(part 1 of 5) Yahoo News, CNN, MSNBC. Each online news organization presents a different spin on the visual and interactive presentation of the news. Most everyone has their favorite resource for getting news online. Perhaps it is the content, or the extension of the TV experience with which you are most comfortable, that pulls you in the direction of one particular news site over another. 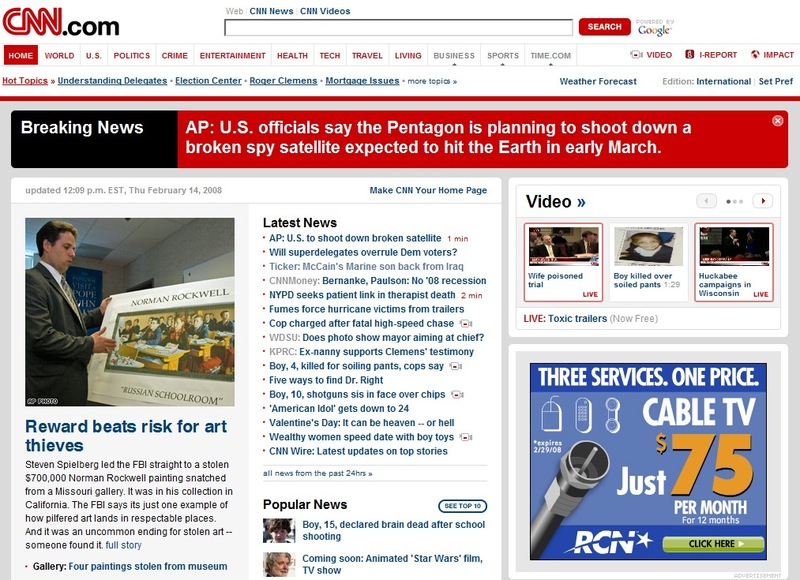 But, what about from the perspective of each online news product’s User eXperience? 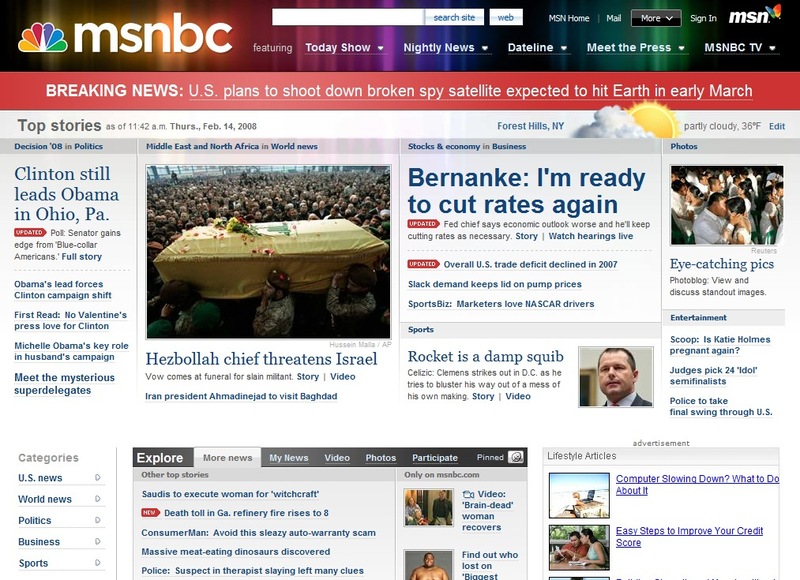 As of December 2007, the top 3 news sites are: Yahoo News, CNN, and MSNBC. The Yahoo News, CNN, and MSNBC websites provide their respective users with different online news experience advantages and disadvantages. Over the next few weeks, I will explore, discuss, and compare the top 3 online news sites, Yahoo News, CNN, and MSNBC, and share with you which, among these three, I find to be the champion of User eXperience in online news. 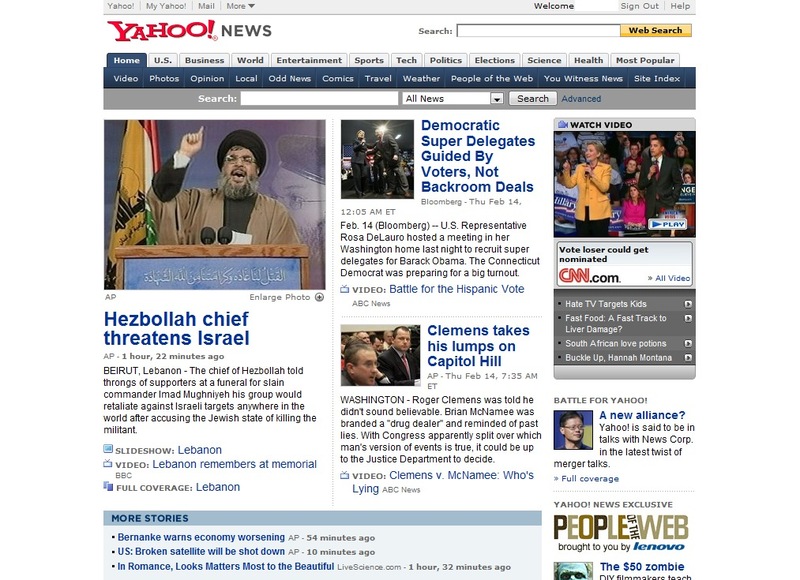 Next, I will be looking at the first of the top 3 news sites, Yahoo News. What online news experience do you most enjoy? The truth is, I stopped visiting these site back around 2002. I used to have a MyYahoo! page and would see headlines that way, but since Web 2.0 (for lack of a better description), I don’t use myYahoo! anymore and only go to these sites if someone reblogs or twits about something interesting (and it’s rarely from one of these sites). Today, my news comes more from shows like democracynow.org, link.tv, blogs, vlogs and from recommended links to specific sources. I agree with Markus Sandy… the corporate media is no longer on my radar. You both bring up good points. What do you see in the future for these online news sites? What do you think they need to do to evolve so that the huge audience that they have today holds? What would they need to do to gain your interest? The beauty of new media is that I “create” my own news experience each time I engage. I use a variety of sites like: HuffPo, link to DrudgeRept, link to WaPo, link to BBC for a sanity check on stories/issues of interest. I also use a very wide range of trade pubs, newsfeeds, blogs, video sites for information flow. Additionally, I work with old media companies and find the recalcitrance and bewilderment with new media, especially the monetization of their franchise, to be startling and ironically funny. Previous Entry Hulu! Where are you? Next Entry Yahoo News. #1 Online News Site.